On the second weekend of August 2015, we finally make the Endau Rompin National Park Trip a reality. We had been talking and discussing about it for few months. This time around, the trip was quite different. The plan was quite extensive. Thanks to the girls. I really appreciate the efforts. We began our journey early in the morning. As planned earlier, we have to be at Bekok town before 11am. We stopped for quick breakfast and bought lunch to be eaten at the park. To get in, we had to ride on four wheel drive car. The road condition was not good and not suitable for average cars. It took us almost 1 hour and a half to get to the destination, Lubuk Tapah Base Camp. It was bumpy and tiring. The four wheel drive before entering the unpaved road. The base camp sits facing the river. We had chicken rice for lunch. The lunch was not bad and definitely required to refuel the energy for trekking later. We did not know the trekking would be quite challenging. Coincidentally, most of us worn red. We did not plan it. Only three of them decided to wear black. After lunch, we began trekking the jungle to the first waterfall. However, the waterfall was not our main target of the day. The trail was quite easy and the tree canopy gives nice shade to us. We finally arrived at the first waterfall called Takah Pandan. Takah means waterfall in Orang Asli language. The first waterfall. It was not that impressive but still interesting to see. We continued trekking to the next waterfall. The trail became harder as we got closer to the waterfall. For some of us, the trail was rather challenging. At times, we had to climb the vertical wall of loose soil. Thankfully, there were tree roots and ropes for us to hold on while climbing. Just look at the trail. Please be prepared every time going out for hiking. Shoes are definitely a must for safety. We finally arrived at the waterfall, Takah Berangin. It was not huge but quite tall and impressive. This shot taken on the side of the waterfall before climbing down to the pool. The waterfall looked nice. The water was cold and seemed untouched. However, there were debris from recent huge downpour. The guide informed us that the waterfall was much nicer before the downpour. Nevertheless, we had so much fun playing in the water. Some of us were quite scared of the water depth. As we got closer to the cliff face, the pool got deeper and edy current from the waterfall pulled us closer to the cliff which could be dangerous. I was actually standing on a slippery rock and worried that I might fall into the deep pool. Saying goodbye to Takah Berangin. After spending 1 hour swimming and playing at the waterfall, we then returned to base camp. The journey was not easy. This time around we had to climb down the cliff. Nevertheless, we arrived at base camp, safe and sound. 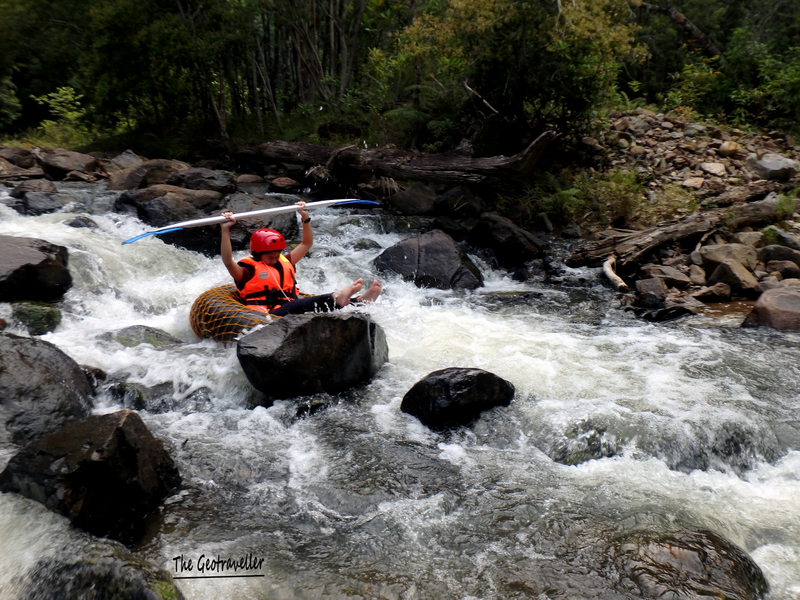 We headed straight to the river and began “tubing” along the mini rapid in front of base camp. Quite thrilling. I have never done white water rafting before, so it was not that bad personally. Just to add to the drama; I fell down from the tube on a rock. It was really painful and hard for me to walk later and felt the excess pain for about two weeks. After tubing, we prepared fire for BBQ; the moment that all of us had been waiting for. Unfortunately, we started quite late and it was already dark by the time we grilled the first batch of the food. Yummy. Who could resist that. After BBQ, we went for a night hike. It was an interesting one. If we turned off the head lamps/ flash light, we could not see anything (due to tree canopy) except the glowed tree barks. The glow came from fungus attached to the barks. There is no proof to show but it is definitely real and interesting. The next day, we began another trekking after a nice breakfast. This time around the trekking took us almost 2 hours. The journey was worth it. The waterfall was not bad, clean and cool. The forest is quite dense. Don’t get separate with your group. You could easily deviate from the trail. We also hiked along the river. Serene and definitely a fresh view for city dwellers like us. The hanging bridge is the land mark because the trekking back to base camp is long and tiring. When we reached here, we know that we were already halfway through. A colony of mushroom along the trek. I wonder if we could eat them. Since this is a National Park, we shall not remove anything. We took a break at the rocks by the river. Very peaceful. Yay! We finally arrived Takah Tempaang after 2 hours of jungle trekking. We didn’t waste our time and jumped into the pool straight away. Notice the waterfall. We could sit there and get natural free massage. We were ready to return by this time. Apparently, there is another waterfall called Takah Tinggi. Takah Tinggi was higher and much further from our location. We need another 2 hours to trek the jungle. Due to time constraint, we decided to return to base camp. The arrowed sign boards showing all the waterfalls. Around 2pm, we reached the jungle hut area and left with the four wheel drive cars to Bekok Town around 3pm. Oh yeah. Before we left, we planted a tree. In Malaysia we called it Kundang. The specific name is Bouea Oppositifolia. For me, as someone who loves nature, I would say that this is the highlight of the trip. We should do this more often. Yes. I hope the tree grows well and big and feed people with the nice and sour fruit. At least one of us will return and document it. Along the way back to KL, we stopped at Yong Peng, KFC and had the loudest late lunch to conclude our trip. It was an awesome one once again. The organizer for the trip (Fatima) has been generous to share the contact of the guide. For this trip, we only paid RM120++ per person. There are other activities we did not choose which may be more interesting for some of you like rafting, visit Orang Asli, etc.